Architectural Specification Program (ASP) | Ron Blank & Associates, Inc.
RBA’s Architectural Specification Program (ASP) is our core program and has been the backbone of our success as a company since 1985. Through this program, our architectural specification representatives meet one on one with spec writers and other design professionals at the largest A&E firms across the U.S. who make decisions about what building products are specified in their projects. Your product could be one of several that are presented to each decision maker every time our reps visit with a design professional. This gives you an edge over your competition, builds product and brand awareness, establishes you as the product expert, and opens the door for your team to follow up with that design professional and follow through to the specification of your products. Ron Blank & Associates, Inc. makes product presentations directly to design professionals including architects, engineers, and interior designers, many of whom are specification writers. RBA representatives, once trained by your team thoroughly about your product, will present and promote your products to ensure that the design professionals and spec writers understand their features, benefits, and applications. 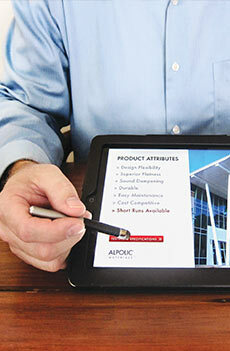 We present your products using a customized iPad based multimedia presentation that we develop in-house. During our presentation, we ask that your company’s product(s) be included in their office master specifications. A firm’s master specification is used to prepare numerous project manuals, meaning the products listed are specified time after time. We also work directly with the project managers to have your products specified on specific projects. Our representatives will present the unique benefits of your product to the spec writer early in the project design process, during pre-design, and at times during the conceptual stage of a project. We try to get a proprietary specification for your product, which will have enormous "holding power." Ron Blank & Associates, Inc. are your "eyes and ears" for upcoming projects in the design stage that have great potential for possible specification. We discover and report jobs before the competition finds out about them. RBA gives your company instant credibility with design professionals. They know we are reliable and will answer questions, solve problems, or assist with specifications. 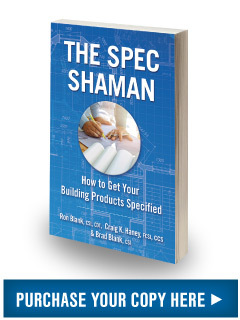 We order digital information, product guide specifications, catalogs, samples, request lunch & learn presentations and other resources from you on behalf of the design professionals to assist them in product selection and for writing their project specifications. To learn more and get in contact with one of our team members, please fill out the form to the right and we will be in contact with you very soon.